Posted on Sun, Jan 8, 2012 : 5:59 a.m.
Michigan football coach Brady Hoke already is focused on the 2012 season. "We'll start today on Team 133," he said Thursday. There was a palpable groan let out by the Michigan contingent of the Superdome when the Wolverines took the field for their first snap of the Sugar Bowl, and All-American center David Molk wasn't at center. Say hello to your future. The Wolverines had a memorable run this year, breaking in the Brady Hoke era with a 10-victory regular season and the Sugar Bowl title. The Michigan football team is especially proud of winning 11 games, just the fifth time that's happened in the program's modern history. But the season already has become just that. History. "We’ll start today on Team 133," Hoke said Thursday. Center David Molk is a Rimington Trophy winner. Michigan is expected to return seven starters on offense and eight on defense, making it one of the most experienced teams in the Big Ten next year. But, where it loses talent is pressing. The Wolverines graduate three of four starting defensive lineman and two of five starting offensive lineman, including Molk, who won the Rimington Trophy this year as the country's top center. 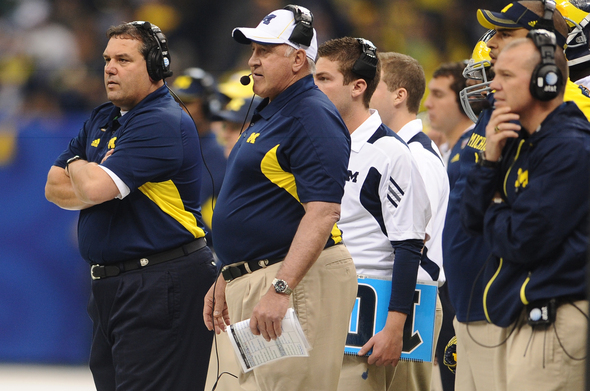 Hoke said Thursday chief among his concerns in the off-season will be rebuilding the defensive line. "That, and the offensive line," he quickly added. "To me, that’s where the game is played and we have some work to do." That process begins with finding a replacement for Molk, a first-team All-America selection. He's been a mainstay in the lineup and started 25 consecutive times, a streak that ended after he injured his right foot in pregame warmups for the Sugar Bowl. Junior Rocko Khoury filled in for a series, providing a snapshot into the future, before Molk returned. Junior Ricky Barnum, who played left guard this year, and freshman Jack Miller also are candidates for the position. Starting right tackle Mark Huyge is gone. He wasn't a star like Molk, but he was solid throughout the season and one of the team's smartest players. Possible replacements could be Michael Schofield, who started nine times at left guard this year, or incoming freshman Kyle Kalis. That's two starters departing from a group that fielded just eight scholarship players this year, the worst depth of Hoke's career. Tight end Kevin Koger also is graduating. The skill positions return relatively intact, except for Sugar Bowl MVP Junior Hemingway. That loss was expected to be mitigated nicely by the return of senior receiver Darryl Stonum, who redshirted this season after picking up a second drunken driving charge, but his status now is uncertain after being jailed Friday for 10 days due to a probation violation. Quarterback Denard Robinson is having his pro stock evaluated by the NFL Draft advisory board, but is expected to return next year. All told, the offense should be an experienced group, and could take a step forward in the second year of coordinator Al Borges' system. Michigan will have, for the first time since 2007, a returner at quarterback who hasn't undergone a scheme change. The biggest uncertainties will be at receiver (if Stonum doesn't return) and on the line. On defense, it's all about the line. Michigan returns every starter at linebacker and in the secondary except Troy Woolfolk, and Thomas Gordon was more effective than him at free safety anyway. Gordon started the Sugar Bowl. But up front, the Wolverines will be crushed by graduation. They lose starters Mike Martin and Ryan Van Bergen, who were the engines behind the defense's turnaround this year, and fellow starter Will Heininger, who was a steady force. The defense finished sixth in the country this year in points allowed (17.4 per game), and could be even tougher next year if reserves such as Will Campbell, Quinton Washington and Frank Clark step up to complement returners Craig Roh and Jibreel Black. An incoming freshman or two also could play a role, especially a tackle such as Ondre Pipkins. If none of those young guys flourish, though, the defense could regress as quarterbacks get more time to pick apart what otherwise will be a stingy secondary. Junior corner J.T. Floyd was so improved this year, he went from an ankle injury sabotaging 2010 to filing for the NFL Draft advisory board in 2011. Hoke said he expects Floyd to return and play opposite Blake Countess, who was a star as a true freshman this year. Together, they could form one of the best one-two punches at corner in the country. And, they'd have steady hand Jordan Kovacs and turnover-machine Gordon playing behind them at safety. Leading tackle Kenny Demens returns to anchor middle linebacker, and Jake Ryan and Desmond Morgan will be back after stellar freshman seasons at outside linebacker. In sum, Michigan will be loaded next year in overall talent, but it's difficult to pinpoint how this will play out. The overall breadth of experience is impressive, but the line play could be suspect, especially early. The Wolverines also won't have a forgiving schedule next year to learn on the job, as they did this year, when they played eight home games and missed the Big Ten's No. 1 and No. 4 teams in the conference season. Its most difficult road game was up the road in East Lansing. Next year, the Wolverines open against Alabama in Dallas and also visit Notre Dame, Nebraska and Ohio State. They get Michigan State at home, but the Spartans will be one of the Big Ten's best next year. The road to 11 wins will be much more difficult next year. Mon, Jan 9, 2012 : 4:14 p.m.
Its possible to be better with a worse record. This year wasnt luck but Alabama, ND, Neb, and Osu away from home isnt easy for any team in the. Those are all bowl teams most likely ranked in the preseason. The schedule this year was a bit favorable but you still have to play and win. That being said take care of home is number one. Second win the games your	supposed to win (games favored). Bama is still a bit better a lot of depth regardless who stays or goes. Not calling it a loss but dont bet your money on that game. Losing your best d line guys when it was very deep is a killer. We can all be naive if we want but no defense is any good with out good line play. The secondary will be back like the last 5.years and 3 coaches and they.still will stink. There is no woodson or leon hall back there no one that can be put on a island alone and shut down the other guy. Add that with a question mark on the d line will make it even worse. A bit concerning about kalis because he was the guy and I know its one game and he has plenty of time.to grow but it sounds like he made his name against guys who weren't at his level and when he had the competition he didnt over power as advertised. All in all I like the class overall but intrigued on how man,o line were signed rather than the d line which is in more of a immediate need. Mon, Jan 9, 2012 : 2:59 p.m.
UM has two tough games on the road next year, Alabama in Dallas, and Nebraska in Lincoln. The rest are wins, so let's start the conversation at 10-2. I personally think they'll beat Nebraska, and if so, they will get a shot in the championship game. I see them 11-1 going in. ...provided they stay reasonable healthy..... The only team on the other side is Wisconsin. UM beats Wisconsin to go 12-1, and takes the Rose Bowl berth. Its' a bit early to project about the PAC-12, but a title, (#43) in Hokes' second year is definitely within reach. Side bar...you can stick a fork in Dantonio, he's done. And Urban Meyer will underachieve,slightly, vs, the expectations of ohio fans...not a good spot to be in. Note to Urban....find a nice rental down there, but don't buy. When the locals find out, you can't beat UM, things get ugly in a hurry. Mon, Jan 9, 2012 : 4:40 p.m.
Should your prediction come true and they become big 10 champs with only 1 loss to Bama, they will play in the one game that's bigger than the Rose. Mon, Jan 9, 2012 : 2:59 a.m.
Tue, Jan 10, 2012 : 4:07 p.m.
Not to mention teams 143 and 162. Mon, Jan 9, 2012 : 12:44 p.m. I have to disagree with you Don, with the heavy pressure and lack of separation with the WO's, VT's defense may have recorded a higher sack count against a less mobile QB. I and many others feel as though AB struggles with a fast blitzing defense, VT acknowledged that publicly after watching film of the MSU game. This isn't a knock on AB, just an area that needs improvement. Mon, Jan 9, 2012 : 3:54 a.m.
Or set free, depending on your perspective. Any decent passing QB could have shredded VT's defense as they stacked 9 in the box and dared Michigan to throw. I'm not sure Borges really trusts Robinson to throw ... certainly not into pick-6 territory. And I'm certain Robinson can't see over the players. Mon, Jan 9, 2012 : 2:54 a.m.
We will have somewhere around 28 new players next season. Whether we improve or get worse will depend on the newest recruits who come in to take over. I like players such as Sione Houma, Drake Johnson, and Ondre Pipkins to be half way decent. Each new face will either fit in or bomb big time. Which of the freshmen do you think will work out? It would help a lot if we could get a top notch WR and teach Denard Robinson how to be a better passer. Sun, Jan 8, 2012 : 11:13 p.m.
Sun, Jan 8, 2012 : 10:53 p.m.
Michigan will do very well at home in 2012. The road game at ND should not be a daunting task because Brian Kelly hasn't figured out who his next QB is yet and Micheal Floyd has graduated. That leaves them with a very suspect offense against a decent Michigan defense. MSU without Kirk Cousins will also be a work in progress. Since it is home game and the Spartans taught the Maize and Blue a lesson on bringing it, look for a another tough game but Michigan will also bring it and gives them the upper hand. Away games at NE and ohio could be a problem. Lots of time to sift through this. Remember, there were a few folks that predicted a 10 amd 2 record for 2011, now known as Team 132 so don't underestimate Team 133. Goal number one will be to win the B1G outright in 2012. Sun, Jan 8, 2012 : 10:29 p.m.
our defense is becoming real tough. i think will campbell will come to play next year. richard ash and quinton washington are both big boys and will plug holes, plus Pipkins will rotate, if not start. Roh, Jibreel black, frank clark and brennen beyer will have the ends, wormley, Godin and strobel will see time. but what I'm most excited about is the linebacking corps. Demmens, Morgan and Ryan. and as good as they can be, their jobs will not be in stone. joe bolden, james ross and RJS will push hard for playing time. and i see bolden as a part-time starter. having enrolled early. the secondary will be ok. Kovacs is solid and i like thomas gordon. JT Floyd needs to get faster and Countess needs to get bigger. which he will. overall, i think our defense will be punishing next season. and STILL young. 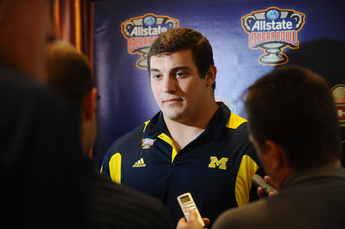 on offense: Kyle kalis needs to start somewhere. I dont care where. He brings size and nastiness to an offensive line that averages below his weight of 300lbs. he and lewan will become the focal points of a great line in the future. but next year we need to see people getting blown off the ball. we didnt move bodies well this year at all. im also excited for thomas rawls to develop as well. hopefully he will be our big back. i love hopkins at fullback. hes the only one (besides gallon) that runs through people when he blocks. Sun, Jan 8, 2012 : 10 p.m.
Michigan is back, I don't see any way that Hoke &amp; Co. will just give up on next season because there are more and tougher credible opponents. We all know: every season brings losses to graduation and NFL drafts. This is NORMAL, not some never-before-seen portent of disaster. As Kyle Meinke himself says: Michigan will field one of the most seasoned teams in the Big Ten, if not THE most seasoned. In addition, the coaches are also more experienced and already have shown impressive ability to adapt their program to their players. No doubt, facing 'Bama right off is a serious challenge. But it's not determinate that &quot;Bama is always good&quot; - we'll have to see how THEY fair when facing a credible opponent in THEIR first game of the season. A win in that game for Michigan would automatically catapult them ahead in several ways. The Team, the coaches and the fans: are already highly motivated. If anything: a tough early game will be a nice change from the traditional Cream Puff Parade we're usually forced to watch. Go Blue! Grow Blue! Win it all in 2012! Sun, Jan 8, 2012 : 9:40 p.m. THIS IS MICHIGAN. NEVER A HURDLE TO HIGH. THOSE WHO STAY WILL BE CHAMPIONS!!!!! Sun, Jan 8, 2012 : 9 p.m.
Sun, Jan 8, 2012 : 6:20 p.m.
Blah, blah, blah. This it college football. This happens every year. New kids step in. Kids improve year over year. Nothing new here, move along. Team 133 will be fine. Mon, Jan 9, 2012 : 3:02 a.m.
Gotta say I can't agree that the first set of Sugar bowl snaps are a glimpse into the future. In the future, Rocko Khoury won't be thrust into the spotlight completely surprised and unprepared to start. He may not even be the starter... who knows. Also Michigan State will not be one of the conference's best next year. That's a ridiculous assertion. They lose Cousins (QB), Cunningham (WR), Martin (WR,PR,KR), Worthy (DT), Strayhorn (DT), Foreman (OG), Anderson (FB), Robinson (S), and Baker (RB)... all starters. All of Sparty's productive starters on offense will be gone besides Bell. Their d-line will be too... only Gholston will be left. Does that sound like a competitive Spartan team to you? Sun, Jan 8, 2012 : 10:59 p.m.
Great comments on the 2012 MSU team. The fact that Sparty taught Michigan a lessson on intensity in this backyeard rivarly will come back to haunt them. Michigan will play very well at home in 2012 and MSU may have a few losses under their belt going into that game. Advantage: Solidly Michigan! Sun, Jan 8, 2012 : 7:23 p.m.
As much as I enjoyed poking fun at Kirk &quot;Cry Baby&quot; Cousins this year, he will be a force in the NFL and he will be sorely missed. There is zero chance that Dantonio replaces him with someone of his caliber next year. I think we can both agree that without Cousins, we'll be able to focus on Leveon Bell with no passing distractions... pun intended. Sun, Jan 8, 2012 : 7:15 p.m.
Agree re: Khoury ... he'll be fine. Might not be Molk, but he'll be good. Agree re: MSU ... considerable upheaval this year to next. If Dantonio maintains the momentum despite that upheaval, then he proves himself a great coach. It may happen ... but I doubt it. Sun, Jan 8, 2012 : 6:08 p.m.
Mon, Jan 9, 2012 : 3:26 a.m.
Michigan pounded a good Nebraska team who pounded MSU, if I recall right. Luck always has a lot to do with a great season. Always has, always will. Michigan was also lucky regarding injuries to key players. That's all part of winning. You people, especially you MSU people, make too much about Michigan's home field advantage. The Alamo had home field advantage. Look what happened to them. In the soon to be forgotten Rich Rod era, home field wasn't an advantage. Good teams win home or on the road. All of you MSU people, enjoy the last 4 years. It'll be a long time before you celebrate a win over Michigan again. Sun, Jan 8, 2012 : 9:53 p.m.
Did you read my post? I just don't understand why you posted this as a reply to what I said. But I guess I agree with most everything you said. I don't think Notre Dame is poorly coached, but everything else is pretty solid. Sun, Jan 8, 2012 : 6:45 p.m.
Dude, &amp; towny), Who did UM beat in 2011. None of the teams in the B10 championship. They beat , barely, a poorly coached ND and OSU. Lost to Iowa, thats Iowa. Barely beat an average VT team with 180 yards of offense. No matter how you dice it. 2011 was a magical season. With more than a few lucky plays. If they rely on that same kind of luck to win in 2012 it's going to be rough. I don't have read on ND yet but the schedule is not even close to the easy one they had in 2011. Alabama, Nebraska, ND, MSU and OSU......it will take more than luck to win 3 out of those 5. Sun, Jan 8, 2012 : 5:18 p.m.
Come on everyone did you not see the total transformation of this team in 2011. How can there still be doubters out there. No NCAA 1 program in the nation had a better turn around in there program than U of M and with this 2012 recruiting class it can only get better. Did you not see this Coaching Staff perform miracles this last season. The players where playing there hearts out all season long. This is the results of learning and believing in a fantastic coaching staff. Look, I know a undefeated 2012 season is a bit over optimistic. But, from the dramatic changes I saw in 2011 we should be expecting even more in the 2012 season. First of all, Roh and Black are defensive ends, not linebackers. Second, the game against Alabama will dictate the rest of the season. A win, or even a close game, will catapult Michigan to a great season, and the Big 10 Championship. Michigan State will be relegated to the usual spot of only winning occasionally against the Blue. Dantonio may take Saban's tack and leave because he'll lose most of the top recruits in Michigan to Michigan. If you remember, Saban left complaining the he was tired of being second fiddle to Michigan. Hoke will continue to recruit great classes and Michigan will return not only to dominate the Big 10, but nationally as well. I could care less about Urban Meyer at Ohio State. Michigan has never lost a game to an Urban Meyer team, and will dominate OSU as well. Michigan is no longer the Michigan of the latter part of Carr's era, and certainly not the Michigan of the Rodriguez era. Just remember, Bo lost to MSU his first year, too. Then it was 10 years before MSU beat Michigan again. Let the fans of MSU try to refute this. They shout the loudest because the fear what's coming. Mon, Jan 9, 2012 : 3:06 a.m. I don't know what you think you know about football, but I played for Bo on the 1969 team, and Bump the 3 years before that. Roh and Black were defensive ends. They played with their hand on the ground. It was RR's 3-3-5 defense that they played linebacker, and weren't very effective. And to the person whosaid that MSU's defense will be better next year...So what. Michigan's offense and defense will be better next year, too. MSU will fall back into the inferior position Michigan forced them into for the prior 41 years. Enjoy the past 4 years. It'll be a long time before you enjoy a win against Michigan again. Sun, Jan 8, 2012 : 7:28 p.m. I know Roh and Black are linebackers. Great linebackers can compensate for a weaker D line. Sun, Jan 8, 2012 : 6:43 p.m.
Keep up the message board stuff for the MSU team. You might want to look at their D and the talent that was red shirted this year. The D will be better next year. And Bell is not a bad running back. O line will be much better. Might have to grind out wins running the ball and playing good D. Kind of like the glory days of UM football 30 years ago. Sun, Jan 8, 2012 : 6:25 p.m.
That didn't make any sense... let me rephrase. WDE and SAM are interchangeable in our defense. Sun, Jan 8, 2012 : 6:21 p.m.
You're wrong. In the 4-3 under, the edge position on the line is maintained by an OLB and a WDE. The positions require nearly the same build and responsibilities. On team 132, Roh and Ryan got the start at these positions. Sun, Jan 8, 2012 : 4:53 p.m. I agree with you 100%. I do not look for MSU to contend with U of M for awhile and Ohio led by Meyer will also not contend with this juggernaut in place at U of M. I totally agree the bama game is key to the 2012 season. Sun, Jan 8, 2012 : 4:08 p.m. It was a magic season. Still, I hope Michigan fans are realists. Starting with Alabama, then away games at Notre Dame, Nebraska, and Ohio&quot;. Michigan could be a much improved next year and have a worse record. I think the O line won't be a problem. looks like Kalis is ready to start as a freshman, and the guys we have should get better. On the D line, It's hard to see any of the backups we have being as good as Martin or Van Bergen. But maybe the linebackers, Roh and Black will improve enough to compensate. But how great that we are back on defense! Alabama would have slaughtered us two years ago. Heck Mississippi State did. Now I can wait to watch that classic match up. What a way to start the season. Go Blue. Sun, Jan 8, 2012 : 7:27 p.m.
Man Woody you are one chipper fellow. I like you're cartoon charisma. Sun, Jan 8, 2012 : 4:36 p.m.
2 years ago ? Why go there. Realistic was 2011 season. Realistic will be 2012 season. We beat many teams a lot of people said no way in 2011. Why doubt 2012. Sun, Jan 8, 2012 : 3:48 p.m. This Stonum situation makes me sick. The kid has 2 DUI's and 2 probation violations, and his only punishment has been being redshirted? Remember the Chris L. Rucker situation at MSU last year? That kid had 1 misdemeanor and 1 probation violation, missed a total of 3 games, and all of us, ALL of us, felt that wasn't enough punishment. Coach Hoke has come out and said that there will be no change in Stonum's status, and now we're all silent? Stonum literally has twice the offenses as Rucker, yet no one in our fan base is calling for any punishment at all. Sickening. Tue, Jan 10, 2012 : 12:15 a.m.
Did I miss something? I thought Coach Hoke said he wouldn't make a change in Stonum's situation until he had all the facts in hand. Guess you call that sickening. He should just can the guy the first time he's asked? I suspect if he does dismiss Stonum, Brady Hoke will tell him personally first, and not let him read it on aa.com. Sun, Jan 8, 2012 : 4:18 p.m. Welcome to reality. A college coach of any sport will only administer punishment commensurate to the player's value to the team. How many times have you seen a coach &quot;give a player another chance&quot; becuase said player will help coach win? I always like when a coach grandstands by kicking a walk-on off the team for some minor transgression. Sun, Jan 8, 2012 : 4:12 p.m.
'we are all silent&quot;, &quot;no one n our fan base is calling for any punishment&quot; Go back and read the comment on the Stonum &quot;situation&quot; 90% of the comments stated that Hoke should cut him loose. Sun, Jan 8, 2012 : 3:24 p.m. This type of article and these types of comments were going on all season long in 2011, especially in the first half of the season... and Coach Hoke and staff and Team 132 proved most people wrong. Sure we will be missing some key players in 2012, but so will 99+% of all college football teams. We have a great foundation and many returning starters, plus a Top 5 recruiting class for this year. We have a top notch coaching staff that knows how to get the best out of players, and they showed that they can coach up freshman to make key contributions. Expect at least 10 wins again this coming season, a probable B1G title, and a BCS bowl game again. Go Blue ! Sun, Jan 8, 2012 : 5:59 p.m. Playing freshman is no longer an excuse at Michigan. We had to play various true freshman that were in the class of 2011, which was the # 21 class according to rivals, and they made key contributions and played key roles (Wile, Clark, Ryan, Morgan, Countess; Beyer also saw action in 11 games). Whether many freshman from the 2012 class will contribute remains to be seen, but Coach Hoke will certainly have the best players on the field. Sun, Jan 8, 2012 : 4:13 p.m. The schedule is much more difficult. Sun, Jan 8, 2012 : 3:56 p.m. The recruits will be true freshman, as such they likely will not contribute much to next year. I see a drop off in wins, although not horrendous. We lose three or four games. Sun, Jan 8, 2012 : 3 p.m.
Eleven wins will be tough with our difficult schedule. But thankfully we are not foolish to hope for them, and we are in fact reasonable to expect something around 10 to 11 wins. After a three year interlude of having to hope for mere mediocrity, we are back to being Michigan. And I thank our coaches who care more about the program and the kids than themselves. Thank you for knowing how to lead. Thank you Hoke. Alabama hasn't always been &quot;monsters.&quot; There was a time several years back that they lost to Northern Illinois, a MAC team. Then Saban took the head coaching job and turned them around. The Alabama players aren't supermen. They can be beat. Sun, Jan 8, 2012 : 4:17 p.m. Right on. I'd hate to see fans start whining if we lose to Alabama. Maybe we'll win but anyone who knows football knows these guys are always monsters. I'm thinking they will probably beat LSU which is a great football team. Sun, Jan 8, 2012 : 2:30 p.m. Totally disagree. I believe U of M football will go undefeated next year. Why all the doubts ? This program is back and will improve in 2012. Best recruiting class coming in at least 15 years. I supported Coach Hoke's hiring from the start and took a lot of heat and heard all the gloom and doom predictions for 2011 and look what happened. If you can not see the bright future of this program you are blind. Did you just forget the total transformation from 2010 to 2011 mainly due to this fantastic coaching staff. Did you forget the defense of 2010 that was turned into the defense of 2011. Did you not see all the true freshmen recruited by Coach Hoke that made a huge difference in the 2011 season. Look for twice as much a impact with this bunch of 2012 recruits. Look for an explosion in 2012 season. All the talent is there lead by one of college footballs best coaching staffs. Come On. Get on board and enjoy the ride. Go Blue !!!!!!!!!!!!!!!!!!!!!!!!!!!!!#1. Mon, Jan 9, 2012 : 8:22 p.m.
Sun, Jan 8, 2012 : 5:02 p.m. While I too would love for UofM to go undefeated next year it simply will not happen. When is the last time the team went undefeated? DO you honestly believe that this team had more talent than that one? With all of the tests on the road we cannot pass them all. We are not on LSU's level yet. This is the coach to get us there, but we need some solid recruiting for a few years to get the talent in to compete at that level. Be a bit objective in your thinking. No one predicted an 11 win season this year, but an undefeated season next year is virtually impossible. Sun, Jan 8, 2012 : 4:33 p.m. Sorry Bruce Kennedy, Reality will be this 2012 season. I took all kinds of heat the beginning of the 2011 season too. Just saying what I see in my opinion. Sun, Jan 8, 2012 : 4:29 p.m.
Hey rightmind 250 you must of been one of the many doubters in 2011 I would bet on it. You where probably a RR supporter too. Hey Scott, watch what Michigan team 133 does to Alabama in the opener. Then you will be a believer. Sun, Jan 8, 2012 : 4:24 p.m. I appreciate enthusiasm, but when it excludes reality I draw the line. UNDEFEATED!? Are you kidding me. Please put down the &quot;Kool-Aid&quot; and join the real world. Sun, Jan 8, 2012 : 4:20 p.m.
Woody- watch Alabama in the national championship game. We are a ways away from being in that category. Sun, Jan 8, 2012 : 2:43 p.m. The ride you must be talking about is in Disneyland. Some people are a little more objective in their thinking. Sun, Jan 8, 2012 : 2:09 p.m. Unfortunately I believe Hoke will view next season as his transition year. We lose a bunch of impact players. Stonum may not return. We won't have the talent or depth at outside WR to go full West coast offense. The schedule is murderous. The incoming class will be good but they will be true freshmen so they're impact won't be felt for at least a season or two. I think a lot of fans and people in the media are already writing off next season as a 7 or 8-win season. Lower expectations to ease the blow of going from 11 wins and a BCS bowl to 8 wins and a middle of the road bowl. Neither one of us know what Hoke is thinking. So for me to say how Hoke views things is incorrect. But, I do have some good rationale for believing next year's team will not match this year's for win output. towny -- I am as true of a Michigan fan as anyone on this board. The difference is I choose to look at the reality of the situation. We'll see where we stand when we play Alabama. I think we'll lose by at least 7 points. If our bowl game was any indication, we're definitely not there yet. Just being realistic. Sun, Jan 8, 2012 : 5:32 p.m.
truebluefan &amp; Ken Boyd - I dont think either of you 'get' the gist of my comment. And here is what that means: It was not about what 'you' (truebluefan) believe or about a realistic assessment of the season. Its about what truebluefan implied that Hoke believes. It's a difference between coach speak (truebluefan - &quot;What else would they say?&quot;) and coach perspective and belief. I believe that Hoke believes next year will not be a &quot;transition year&quot; that results in a down season and a reason to have lower expectations. Which is what you implied: &quot;I believe Hoke will view next season as a transition year&quot; - and then you name all the reasons we should have lower expectations. I dont for a minute believe that Hoke believes that in transition years or that transition years, if others believe in them, should equal expect not to realistically compete for the Big Ten championship. Here's the takeaway - When you fit your scheme to the personnel you have, you are not transitioning. Every season is its own thing. Every team is its own entity. That is how good coaches run their offense every year - no matter the personnel. Its about adjustment and fit for that season. There is no transition. Sun, Jan 8, 2012 : 5:27 p.m. I totally disagree also. You have a senior quarterback coming back that is explosive and you expect a transition year. Look at what this years freshmen Coach Hoke's recruits contributed. Truebluefan I say you do not sound like a true blue fan. Sun, Jan 8, 2012 : 4:21 p.m.
edjasbord -- every coach expects their team to compete for championships. What else would they say? I believe we won't see championship level football next season. We won't be bad by any stretch but we won't be BCS caliber either. I would be completely blown away if we're playing in the B1G championship game next season. Sun, Jan 8, 2012 : 3:52 p.m. It is not about&quot;getting coach Hoke'&quot; whatever that means. trueblue is simply assessing the season from a schedule and personnel point of view. Nothing more, nothing less. Sun, Jan 8, 2012 : 3:06 p.m. I could not disagree more, and I dont think you understand Hoke if you have that opinion. He believes that every year UM should compete for the Big Ten Championship. He said this over and over - AND its clear that he believes this wholeheartedly. He does not believe in &quot;transition years&quot; - if they mean not competing for a Big Ten title. He believes that if the transition is done right, you will still be in a position to compete for Bit Ten Champs. Seriously, you dont 'get' coach Hoke if you think he will approach this year expecting it to be a down year. Sun, Jan 8, 2012 : 1:37 p.m. I really think all is ok now that we have a coaching staff intact. Sun, Jan 8, 2012 : 1:35 p.m.
No question that 11 will be tough to get, BUT I do take issue with a few things. Saying MSU will be one of the Big Ten bests begs the question why? They are losing their quarterback and the top receiver in the history of the school. They will also get one of their losses from this year, Iowa, at home. I also think Ohio State will be much tougher in two years. They really have nothing to play for next year with their bowl ban. Finally, Nebraska is over rated. Did you watch the game this year, or their bowl game? In looking at the schedule, I think we can pencil in 7 wins. That means in the other 5 games UM will need to go 3-2 to make 10 wins in the regular season and win their bowl game to reach 11 wins. Sun, Jan 8, 2012 : 3:50 p.m.
MSU should be very good next year. The Spartans return 18 of twenty two on defensive two deeps. That number includes Worthy leaving. The Spartans also return all on offense except QB and two WR's and one lineman. If Arnett is eligible next year, and he should be, they will be a tough out for Michigan. Sun, Jan 8, 2012 : 1:52 p.m. They return their whole offensive line. That's a pretty good start for a new qb. They only lose Worthy on defense. I am not a sparty fan but, they should be good. Sun, Jan 8, 2012 : 1:31 p.m. The defensive line is a huge concern. I saw Ondre Pipkins in the us army game. He looked better than anything UM presently has. Kalis was so, so. He didn't over power anybody in fact he got bullrushed quite a bit. He's going to need to gain some strength to play tackle full time. They had him at guard for most of the game. Countess and Floyd the best in the country? Where did you come up with that? They got burned big time when they were actually tested. I think they will be as solid as any UM team in the last 5 years, but they won't even be the best pair in the B10. Sun, Jan 8, 2012 : 8:54 p.m. These guys are high school guys. Cannot judge these guys based on that all star game or against high school talent. Very few linemen can step in as frosh and be effective. Even Jake Long redshirted. Countess will be a stud, wrongmind. He is very good already and continued practice will only make him better. Floyd will be solid. Who will be better pair in the B10? Sun, Jan 8, 2012 : 4:46 p.m.
Another year of maturity for these young players will make a big big difference. Coaching staff has definitely got to be feeling more secure versus last year. Sun, Jan 8, 2012 : 1:17 p.m.
11 wins or not, we finally have a coach who understands the game and tradition at Michigan. Go Blue! Sun, Jan 8, 2012 : 12:56 p.m.
11 wins will be tough to get, but luckily there is a lot of returning starters for Hoke to use. I don't see any reason why he can't get that many wins...&quot;This is Michigan for God's sake&quot;. Hoke has also stated before that their goal is to win Big Ten championships. So really, the number of wins doesn't matter, it's the B10 Championship is what he's after. I disagree with you on a cpl points Klondike. Michigan will lose against Alabama, yes. But I feel that Notre Dame takes a step backwards next year and with Al Borges currently getting a better feel for the personnel that he has now we go on the road against ND and get a victory. MUS will also go backward bc they will be starting a new QB and losing their best receiver ever in Cunningham and losing Worthy on the D-line. Plus MSU is a home game. Possible that Hoke and company beats MSU last year simply bc it would've been at the big house. Nebraska will be tough on the road so I do think we lose that one. But I feel that Urban Myer's new system takes a little while to take hold and we get a win in Columbus next year too. Heck Mattison took a lot of heat for his scheme and play calling against OSU this past year because they did things offensively that went against their tendencies. I don't feel that Mattison allows that next year. He will be better prepared. So Your 5 losses, I only see 2. Losses against Alabama and Nebraska. The rest are W's. GO BLUE!!!!!! Sun, Jan 8, 2012 : 5:09 p.m.
Sun, Jan 8, 2012 : 2:26 p.m.
&quot; don't see any reason why he can't get that many wins...&quot;This is Michigan for God's sake&quot; 1. You will finish the regular season with 5 losses: Alabama, MSU, ND, Nebraska, and OSU. You had a VERY easy schedule this year without any tough road games outside of MSU and Iowa (both of which you lost). That is reason #1 you will not get that many wins. 2. You lose two best defensive players and 2 of your most important offensive players. Reason #2. 3. &quot;This is Michigan for God's sake&quot;. That means nothing other than an chalking up an additional loss to arrogance.